Sir Charles Wheatstone /ˈwiːtstən/ FRS HFRSE DCL LLD (6 February 1802 – 19 October 1875), was an English scientist and inventor of many scientific breakthroughs of the Victorian era, including the English concertina, the stereoscope (a device for displaying three-dimensional images), and the Playfair cipher (an encryption technique). 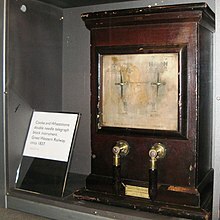 However, Wheatstone is best known for his contributions in the development of the Wheatstone bridge, originally invented by Samuel Hunter Christie, which is used to measure an unknown electrical resistance, and as a major figure in the development of telegraphy. Charles Wheatstone was born in Barnwood, Gloucestershire. His father, W. Wheatsone, was a music-seller in the town, who moved to 128 Pall Mall, London, four years later, becoming a teacher of the flute. Charles, the second son, went to a village school, near Gloucester, and afterwards to several institutions in London. One of them was in Kennington, and kept by a Mrs. Castlemaine, who was astonished at his rapid progress. From another he ran away, but was captured at Windsor, not far from the theatre of his practical telegraph. As a boy he was very shy and sensitive, liking well to retire into an attic, without any other company than his own thoughts. In September 1821, Wheatstone brought himself into public notice by exhibiting the 'Enchanted Lyre,' or 'Acoucryptophone,' at a music-shop at Pall Mall and in the Adelaide Gallery. It consisted of a mimic lyre hung from the ceiling by a cord, and emitting the strains of several instruments – the piano, harp, and dulcimer. In reality it was a mere sounding box, and the cord was a steel rod that conveyed the vibrations of the music from the several instruments which were played out of sight and ear-shot. At this period Wheatstone made numerous experiments on sound and its transmission. Some of his results are preserved in Thomson's Annals of Philosophy for 1823. He recognised that sound is propagated by waves or oscillations of the atmosphere, as light was then believed to be by undulations of the luminiferous ether. Water, and solid bodies, such as glass, or metal, or sonorous wood, convey the modulations with high velocity, and he conceived the plan of transmitting sound-signals, music, or speech to long distances by this means. He estimated that sound would travel 200 miles per second (320 km/s) through solid rods, and proposed to telegraph from London to Edinburgh in this way. He even called his arrangement a 'telephone.' (Robert Hooke, in his Micrographia, published in 1667, writes: 'I can assure the reader that I have, by the help of a distended wire, propagated the sound to a very considerable distance in an instant, or with as seemingly quick a motion as that of light.' Nor was it essential the wire should be straight; it might be bent into angles. This property is the basis of the mechanical or lover's telephone, said to have been known to the Chinese many centuries ago. Hooke also considered the possibility of finding a way to quicken our powers of hearing.) A writer in the Repository of Arts for 1 September 1821, in referring to the 'Enchanted Lyre,' beholds the prospect of an opera being performed at the King's Theatre, and enjoyed at the Hanover Square Rooms, or even at the Horns Tavern, Kennington. The vibrations are to travel through underground conductors, like to gas in pipes. It was initially resistant to cryptanalysis, but methods were eventually developed to break it. He also became involved in the interpretation of cypher manuscripts in the British Museum. He devised a cryptograph or machine for turning a message into cypher which could only be interpreted by putting the cypher into a corresponding machine adjusted to decrypt it. 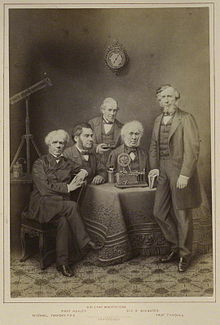 ^ "Wheatstone, Sir Charles". Oxford Dictionaries. Retrieved 28 January 2015. ^ "No. 23349". The London Gazette. 4 February 1868. p. 535. ^ Gaskins, Robert. "Portfolio of Historic Concertina Patents". 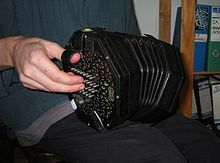 www.concertina.com. Retrieved 19 March 2018. ^ Ronalds, B.F. (2016). "Sir Francis Ronalds and the Electric Telegraph". Int. J. for the History of Engineering & Technology. doi:10.1080/17581206.2015.1119481. ^ Brian Bowers (2001). 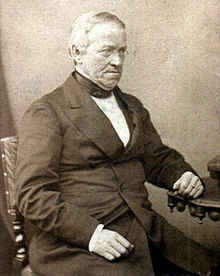 Sir Charles Wheatstone FRS: 1802–1875 (2nd ed.). IET. pp. 207–208. ISBN 978-0-85296-103-2. ^ George Gore (1878). The Art of Scientific Discovery: Or, The General Conditions and Methods of Research in Physics and Chemistry. Longmans, Green, and Co. p. 179. ^ Wheatstone (1836). "On the prismatic decomposition of electrical light". Report of the Fifth Meeting of the British Association for the Advancement of Science; Held at Dublin in 1835. Notices and Abstracts of Communications to the British Association for the Advancement of Science, at the Dublin Meeting, August 1835. London, England: John Murray. pp. 11–12. ^ John Munro (1891). Heroes of the telegraph. The Religious tract society. p. 30. ^ Beauchamp, Ken (2001). History of Telegraphy. Institution of Electrical Engineers. pp. 34–40. ^ Sullivan, Gertrude : A Family Chronicle published in 1908 (London, John Murray) by her niece, Gertrude Lyster. Pages 216–7. ^ Bemer, Bob. "How ASCII Got Its Backslash". Retrieved 4 August 2014. ^ "Kleinschmidt – Our History". Archived from the original on 22 April 2014. Retrieved 4 August 2014. ^ See Wheatstone's 1838 paper "Contributions to the Physiology of Vision.—Part the First. On some remarkable, and hitherto unobserved, Phenomena of Binocular Vision" at this site. ^ See Wheatstone's 1852 Bakerian Lecture "Contributions to the Physiology of Vision. – Part the Second. On some remarkable, and hitherto unobserved, Phenomena of Binocular Vision (continued)" at this site. ^ "The Genesis of the Wheatstone Bridge" by Stig Ekelof discusses Christie's and Wheatstone's contributions, and why the bridge carries Wheatstone's name. Published in "Engineering Science and Education Journal", volume 10, no 1, February 2001, pages 37 – 40. ^ Marks, Leo (1998). Between Silk and Cyanide. New York: The Free Press. ISBN 0-684-86422-3. ^ Howarth, O.J. (1922). The British Association for the Advancement of Science: A retrospect 1831–1921. This page was last edited on 11 April 2019, at 12:41 (UTC).